Understanding the abundances of molecules in dense interstellar clouds requires knowledge of the rates of gas-phase reactions between uncharged species. However, because of the low temperatures within these clouds, reactions with an activation barrier were considered too slow to play an important role. Here we show that, despite the presence of a barrier, the rate coefficient for the reaction between the hydroxyl radical (OH) and methanol—one of the most abundant organic molecules in space—is almost two orders of magnitude larger at 63 K than previously measured at ∼200 K.
We also observe the formation of the methoxy radical product, which was recently detected in space. These results are interpreted by the formation of a hydrogen-bonded complex that is sufficiently long-lived to undergo quantum-mechanical tunnelling to form products. 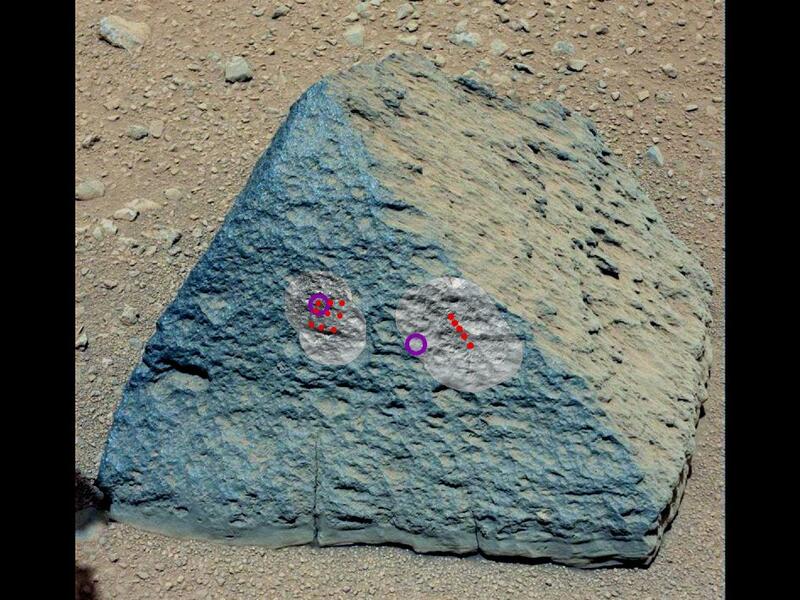 This image shows where NASA’s Curiosity rover aimed two different instruments to study a rock known as “Jake Matijevic.” The red dots are where the Chemistry and Camera (ChemCam) instrument zapped it with its laser on Sept. 21, 2012, and Sept. 24, 2012, which were the 45th and 48th sol, or Martian day of operations. The circular black and white images were taken by ChemCam to look for the pits produced by the laser. The purple circles indicate where the Alpha Particle X-ray Spectrometer trained its view. 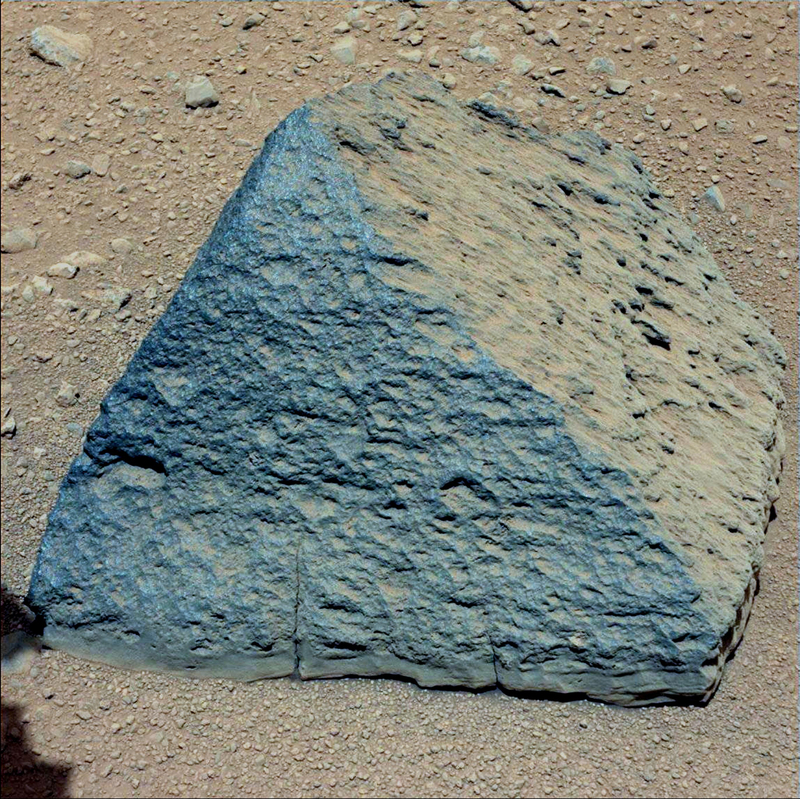 This image was obtained by Curiosity’s Mast Camera on Sept. 21, 2012 PDT (Sept. 22 UTC), or sol 46. An unannotated version of this image is also available. A chrondite meteorite in situ in Rub’ al Khali, Saudi Arabia. Earth is under constant bombardment by space rocks. When they crash and burn through the atmosphere, most of the debris gets lost to the oceans, while some is buried or gradually weathered away. 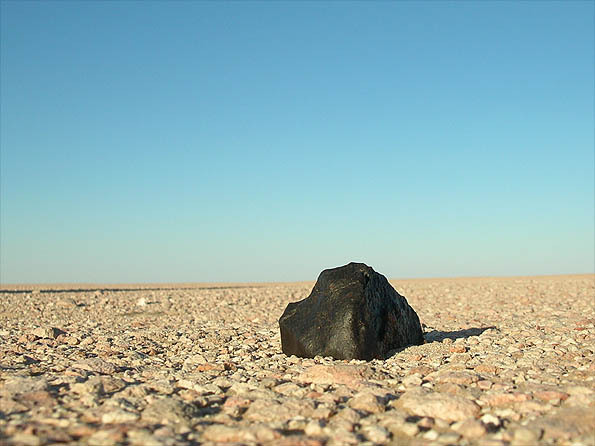 Nonetheless, plenty of chunks of fallen meteors, or meteorites, are strewn across the accessible parts of the planet. So far, more than 40,000 meteorites have been found and catalogued, and countless more are still out there, waiting to be chanced upon. If you need further incentive for finding something that was forged at the birth of our sun and contains secrets about the nature of our solar system, there’s this: Space rocks are worth as much as $1,000 per gram. The following tips will get you started on your search, but be warned: This extraterrestrial treasure hunt requires hard work and dedication. Scientists have virtually ruled out the possibility of life on Mars having revealed the planet experienced a 600 year water drought. Samples of soil found that the surface had been starved of any moisture that might enhance the view that there are living organisms on the red planet. Researchers spent three years gathering the the specific particles, which they likened to the soil found on the Moon – where it is conclusive that no life exists. 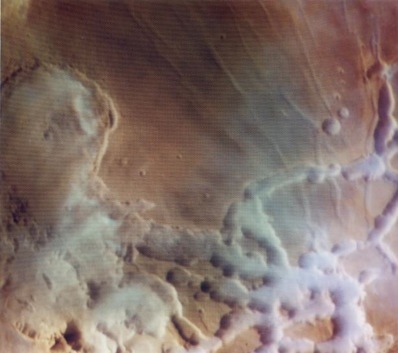 Dr Tom Pike, who fronted the study, said: ‘We found that even though there is an abundance of ice, Mars has been experiencing a super-drought that may well have lasted hundreds of millions of years. ‘We think the Mars we know today contrasts sharply with its earlier history, which had warmer and wetter periods and which may have been more suited to life. The sample was collected during Nasa’s 2008 mission to Mars and was extracted from the northern region of the planet. Despite that area being arctic, separate studies revealed that the planet in its entirety is covered with the exact same substance. 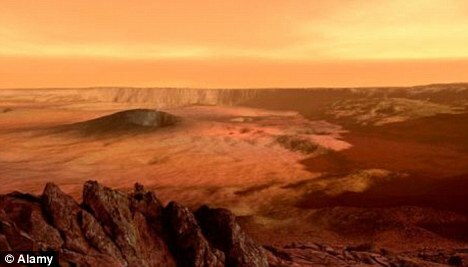 The results noted that most Earth-like organisms would need to retreat underground to survive on Mars. Below ground, there is sufficient pressure for water to be kept in a liquid state, which would enable microbes to thrive. Possible life in the Martian trenches? A team of scientists at the Planetary Science Institute in Tucson, Arizona, have drawn attention to a couple of small mineral-rich depressions on Mars that, perhaps relatively recently in the red planet’s history, could have been places for life. The smectites that Weitz speaks of are a silica and aluminum based type of clay also found to contain iron or magnesium. This specific substance, which readily expands or contracts under the influence of water, is formed from other silicate materials which have been altered in the presence of non-acidic water. Context: The chemical composition of a molecular cloud changes dramatically as it collapses to form a low-mass protostar and circumstellar disk. Two-dimensional (2D) chemodynamical models are required to properly study this process. Aims: The goal of this work is to follow, for the first time, the chemical evolution in two dimensions all the way from a pre-stellar core into a circumstellar disk. Of special interest is the question whether the chemical composition of the disk is a result of chemical processing during the collapse phase, or whether it is determined by in situ processing after the disk has formed. Methods: Our model combines a semi-analytical method to get 2D axisymmetric density and velocity structures with detailed radiative transfer calculations to get temperature profiles and UV fluxes. Material is followed in from the core to the disk and a full gas-phase chemistry network — including freeze-out onto and evaporation from cold dust grains — is evolved along these trajectories. The abundances thus obtained are compared to the results from a static disk model and to observations of comets. 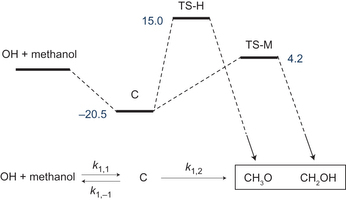 Results: The chemistry during the collapse phase is dominated by a few key processes, such as the evaporation of CO or the photodissociation of H2O. 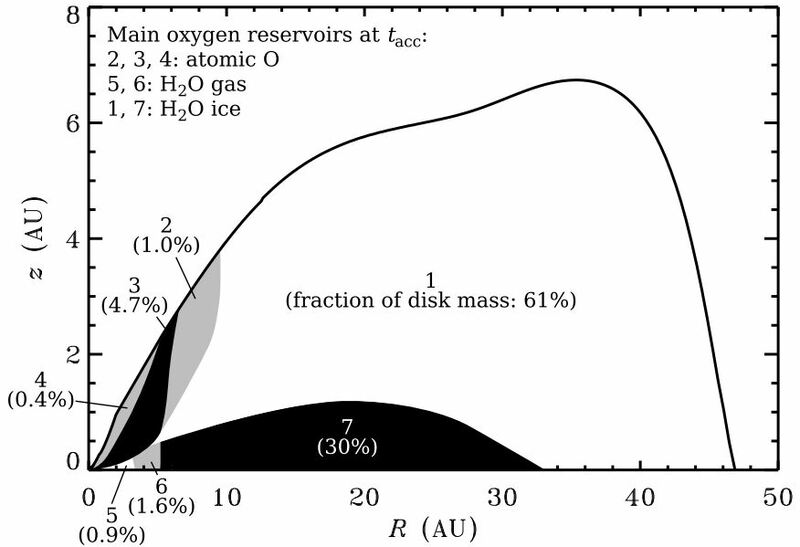 At the end of the collapse phase, the disk can be divided into zones with different chemical histories. The disk is not in chemical equilibrium at the end of the collapse, so care must be taken when choosing the initial abundances for stand-alone disk chemistry models. Our model results imply that comets must be formed from material with different chemical histories: some of it is strongly processed, some of it remains pristine. Variations between individual comets are possible if they formed at different positions or different times in the solar nebula.